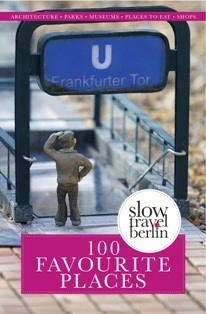 As regular readers of Under a Grey Sky will know, I am closely involved with the Slow Travel Berlin project. What began as a website that “encourages us to slacken our pace, re-consider our motivations and embrace a “less is more” instead of a “fast is better” ethos,” has developed to become not only one of the best English-language resources about the city for travellers and Berliners alike, but also offers a wide selection of tours and workshops to help people engage directly with the city. I have been running a number of different tours for Slow Travel Berlin over the past year, including a neighbourhood stroll through my home kiez of Wedding and some walks along the Berlin Wall Trail, which also tie into my new project at Traces of a Border. Whilst we were developing the tours, creating a weekly what’s on guide to the city, and the team of over twenty writers and photographers were keeping the website full of fascinating articles about the city, Paul, Marian, and Giulia were working with a good number of contributors to put together Slow Travel Berlin’s first book – 100 Favourite Places – which is available in print and e-versions and will be launched with a party in the city next week. From the outside looking in I have watched the three editors and the team work incredibly hard to pull the book together, and from the sample pages (follow the book link above) it is obvious that this is not only “not your normal guidebook” but something that should be on the shelves of anyone with an interest in the city, whether they live here or not! The Slow Travel Berlin project is a wonderful thing. Not only is it a great resource, but it is a great community, from designers to illustrators, writers to photographers, and of course the readers and those who join us on the tours. There are so many website and projects that are based in Berlin, and in particular in English, that do not truly engage with the city, or if they do only within a very small, expat-dominated bubble, and I think it is to Paul and the rest of the team’s credit that Slow Travel Berlin covers such a wide variety of topics about life in the city and has, when you look at all the facebook fans and other commentators, a large amount of local readers, whether German or otherwise. This entry was posted in Books, We like... on November 13, 2013 by Paul Scraton. What to read when coming to Berlin and wanting to take it slow – a great guide-book for all those who prefer to stroll than to run. Aw this was lovely, thanks Paul!